Print books are preferred over e-books by parents as well as children when they read together, according to a new study from the Joan Ganz Cooney Center at Sesame Workshop that found 89.9% of iPad owners read “mostly print books and some e-books” with their children, 7.5% read both formats equally with their children, and 2.7% read “mostly or exclusively” e-books. Almost 75% of the responding parents said they prefer co-reading print books, with more than 50% of their children agreeing. 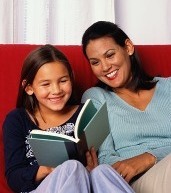 Fewer than 10% of parents or children prefer co-reading e-books exclusively.